Photo via Getty Images/Hulton Archive. Consider—if you will—the fate of the trend, which is to fall dramatically from grace. 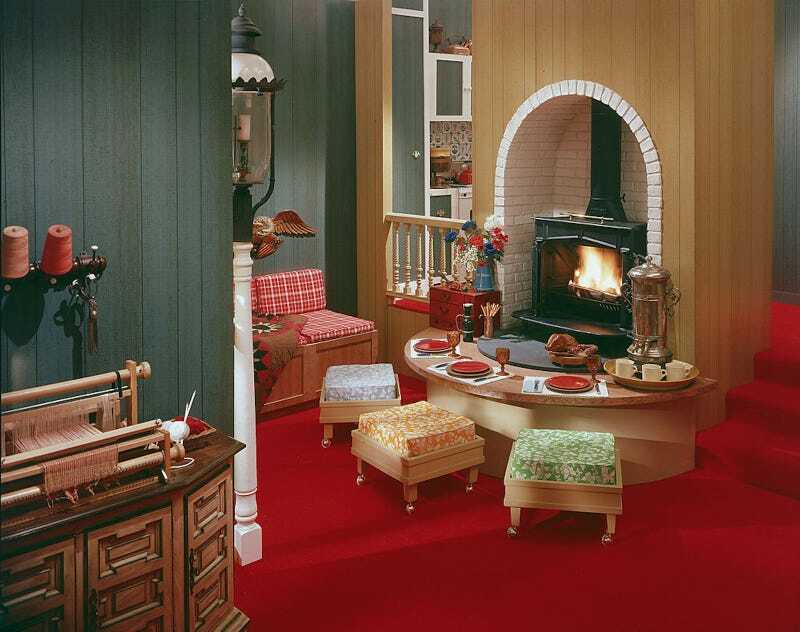 For instance, these “model” interiors from the 1970s. Look on my works, ye mighty, and despair! Again, please note the inexplicable loom on the credenza. We cannot move on until you have fully processed the presence of a random loom on a random credenza. Perhaps you were looking for something a little more traditional. In that case you should opt instead for a table-scape of green and mustard yellow. Maybe you’d rather devote yourself to the kitchen. What if, instead of doing a backsplash or subway tiles, you echoed your linoleum pattern above your sink, as part of your open shelving? Maybe that’s not quite colorful enough, however. What if you did pink and green, plus a plaid wallpaper pattern, and finally, as the crowning achievement, a patterned ceiling? You have options, that’s my point. From to ubiquity to ignominy! Such is the future of shiplap and, indeed, all forms of reclaimed wood.